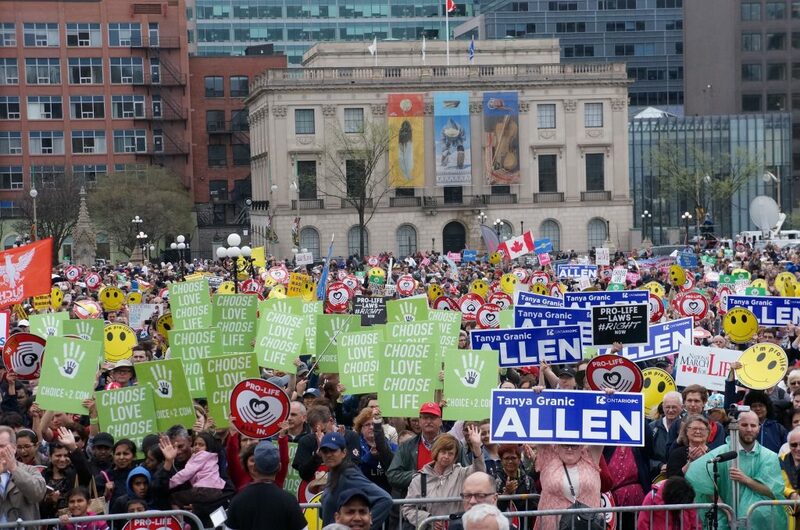 Thousands of pro-life Canadians participating in the National March for Life May 10 were forced to reverse course by a small counter-demonstration blocking the route. The 75 to 100 counter-protesters, some wearing black bandannas over their faces, screamed chants and waved signs halting Canada’s largest prolife protest for at least 20 minutes before marchers turned around, passed by Parliament Hill again and took a new route through the streets of downtown Ottawa. At the pre-March rally on the Hill, the marchers were warned about the counter-demonstrators. “Only in that disposition will we see the way in which these great evils will be overcome,” he said. Cardinal Collins noted Parliament Hill was a “place of political power” and that people of faith are the ones who step forward to help the needy and marginalized. The attack is “part of a much greater struggle,” that must be “put into the context of the great struggle of good and evil,” he said. Political action alone can’t make the profound changes needed in the human heart , he said. Only prayer can do that. “A sign of hope” is that the proponents of abortion and euthanasia “seem to be ashamed” of these acts, so they called abortion a “termination of pregnancy” and euthanasia “medical aid in dying,” he said. Every human life is precious, he said. There is lots of talk about being inclusive these days, but real inclusiveness is a willingness to welcome, and to accompany those who are suffering, weak, or fragile. 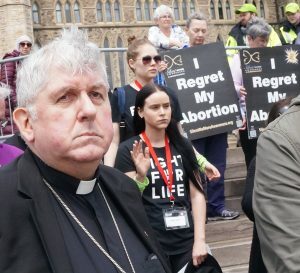 At least 10 Catholic bishops were present on the Hill, including Ottawa Archbishop Terrence Prendergast, Montreal Archbishop Christian Lépine, and Kingston Archbishop Brendan O’Brien. Speaking on behalf of about 10 pro-life MPs and Senators, Conservative MP Harold Albrecht pointed out Canada destroys the lives of 100,000 unborn children a year. Former Ontario Progressive Conservative Leadership candidate Tanya Granic Allen, who was disqualified by the party leader Doug Ford as a candidate for MPP, thanked the marchers for their support. “You stand for human rights for the unborn and for free speech, just like I do,” she said. Campaign Life Coalition president Jim Hughes said the Canadian March for Life was inspired by the late Nellie Gray who began the National March for Life in the 1970s after the Roe vs. Wade Supreme Court decision legalized abortion in the U.S.
Gray always said no compromises, no exceptions, no excuses and no apologies in the defense of life, Hughes said. “Remember you are the shining hope, the candle in the darkness when you get back home,” Hughes said. Hughes estimated between 10,000 to 15,000 participated in this year’s March, down considerably from last year’s more than 20,000. Some cancelled when weather reports forecasted rain, he said. Also, the March rally was confined to the walkway to the Peace Tower and the west lawn of Parliament Hill, cutting off the east lawn as it is being re-sodded after a skating rink to mark Canada’s 150th Anniversary was taken down. This is the second year protesters have forced the March to re-route at the last minute. Hughes said some marchers were angry the police did not clear the counter-protestors out of the way. “I would think the police acted with great discretion,” said Hughes. This is the second year protesters have forced the March to re-route, but the first time they have forced it to completely turn around. Police blocked off the block of Bank Street where the Morgentaler abortion facility is located, and two police cars parked on the sidewalk opposite.